April 17, 2011 - Earth Day Award for 4th Graders. Edgewood fourth graders received first prize at the Westchester County's Earth Day Awards for developing and implementing an Earth Education Ecosystem Project. Students made self-sustaining ecosystems out of recycled soda bottles. This vivarium featured a homemade aquarium on the bottom and terrarium on top. Students studied environmental changes when adding pollutants to the vivarium as a means to prompt discussion on practical solutions for helping keep the Earth healthy and happy! The ceremony took place at the Kensico Dam in Valhalla, NY. 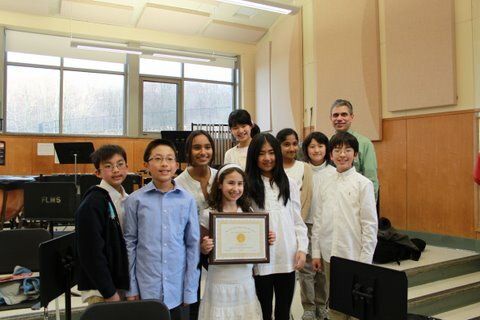 April 5, 2011 - NYSSMA Gold for Edgewood! The Edgewood Chamber Orchestra, under the direction of Enrique Orengo, participated in the New York State School Music Association’s (NYSSMA) Major Organization Festival. The festival is an opportunity for school instrumental groups to demonstrate in performance a long list of challenging musical and technical ensemble skills. The NYSSMA adjudicators were very taken by the orchestra’s “professional” demeanor, preparation and musical performance. The Edgewood Chamber Orchestra received the highest rating, the Gold Award.